Making a switch between technologies is sometimes difficult and it always helps to establish parallels between them during the learning phase. Recently, I met someone who had worked on object-oriented programming languages like C# and had to start learning T-SQL in order to work on a new Agile project that was coming his way. In order to help him get started, the first thing I did was to establish a parallel on how to declare new variables in a module/script. Just as one can declare more than one variable in a single statement in C#, one can do so in T-SQL. This actually came as a surprise to a few of my team-mates, which is why I decided to write it up as a T-SQL basics post. 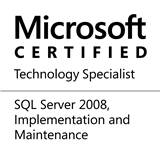 Do keep in mind though that starting SQL Server 2008, the DECLARE statement can generate exceptions if you perform declarations and initialization/assignment in the same statement. This entry was posted in #SQLServer and tagged #SQLServer, #TSQL, Development, Tips on August 1, 2016 by nakulvachhrajani.